The 23 SE is the new design for 2012. The 23 SE is the new design for 2012. The SE is a full finished liner boat like the LE, without as many storage compartments on the deck. We combined some of the in-floor hatches to make a large insulated fish box that will keep ice for days, plus the new console choices that can be used for all 3 of the models. The freeboard i.e. the height of the sides was increased just a little so our customers can truly customize their boat. With a new console design, electronics up to 12 inches can be flushed mounted in our new locking recessed dashboard. The new Dorado 23 can be powered by an array of engine choices mounted on a custom color matching hydraulic Porta Bracket. Whether you want to hit the backcountry sneaking into less than a foot of water or go 30 miles offshore, the 23 can take you to the fish! 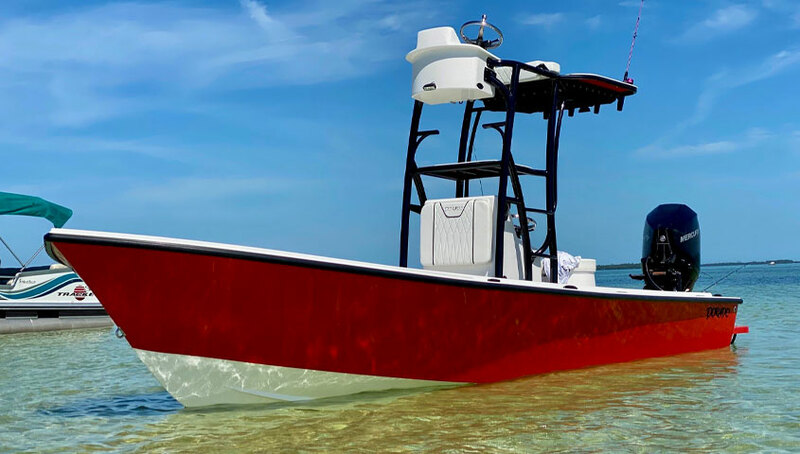 The 23 Dorado Custom Fishing Boat is the most structurally sound, lightest and shallowest running boat in its class. Want to talk EFFICIENCY? How about cruising loaded, burning 7 GPH at 29 MPH! You will continually average a 4-to-1 ratio at cruise.